A beautiful house constructed along a medium bank waterfront property always seems mesmerizing and nothing can be much better than this. The ambiance created inside with such surroundings, natural colors and cool breeze allows you to enjoy privacy and have a fun time together with the family. Keeping this privacy aspect in mind, I have found a very interesting architecture that not only balances the ambiance in context with the surroundings, but also supports the modern lifestyle of the members. This Washington State based architecture is mesmerizingly gorgeous and is located on a heavily wooded medium bank waterfront property. 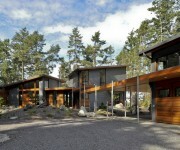 This residential structure on Lopez Island, Washington is a carefully sited architecture amongst the trees and landscape, which actually slopes up to the bank and view. 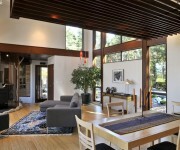 The arrangement of the entire space captivates the viewers in the first glance itself and forms a beautiful connection with the outdoors, thus creating a balance of the interiors with exteriors. 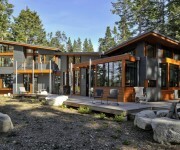 The angle of living wing keeps up a correspondence to the bank and creates a beautifully cuddled outdoor deck area. The residential plan reaches out to the southeast path to the beach, to gardens, to the east and most importantly, to the west and northwest views of the turquoise water. The structure of the house encompasses the main section with an isolated upper level master and the studio which houses the art spaces. 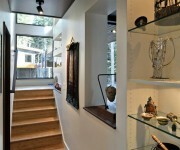 An arcade connects the studio with the house and also serves as the main approach to the house. In the entry process, including a Tibetan prayer wheel in a special niche, one can feel the Asian influence, which undoubtedly creates a center of attraction. 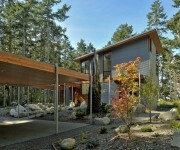 Moreover, the house forms are simple, derived from the site relationships and the desire to maximize daylight. The combination of materials like hard vs. soft, warm vs. cool are very honest, evening and comfortable, as well. The structure not only provides enough space for the family members to entertain their guests, but also supports modern island living. 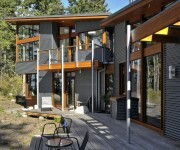 David Vandervort Architects is a Seattle based medium sized firm that was founded in 1994. 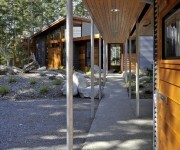 Their architecture is purely influenced by the beauty and tradition of the Northwest. They intent to create architectural designs that respect the land, reflect their clientele needs and enhance the modern living of the family members. They not just remodel, but also create fresh architectures and focus their designing on both residential and commercial projects. 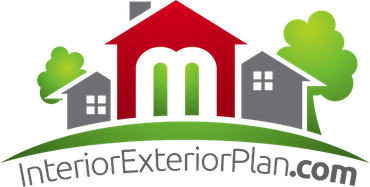 Since 1994, they have designed restaurants, mixed use buildings, churches and lots more. 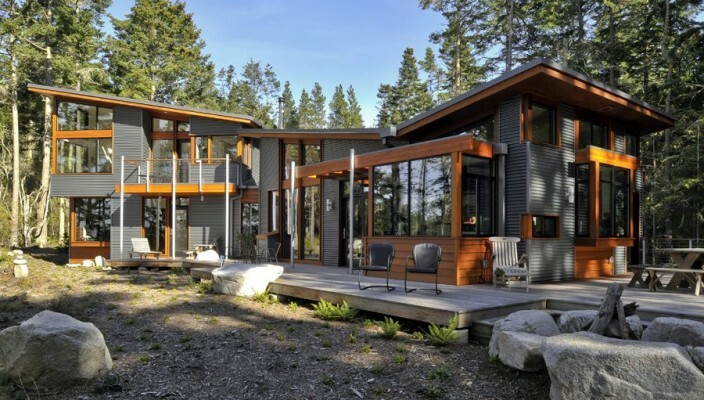 While designing Lopez Island residence, their main idea was to create a structure that beautifully satisfies the requirements of the family members.